In a 1940s vintage cream and gold dotted dress, Amy Huberman graced the stage to accept her IFTA award for Best Actress in a Lead Role in Drama on Saturday evening in the Round Room of the Mansion House in Dublin. 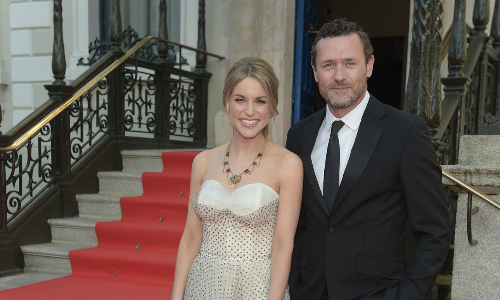 Recognised for her lead role in Striking Out the Irish based original drama series for RTÉ One, following the tumultuous professional and personal life of Dublin-based solicitor, Tara Rafferty (Amy Huberman) and her fledgeling legal firm. IFTN: ‘Striking Out’ is now available in America. How does it feel to have the show being viewed by an audience there? 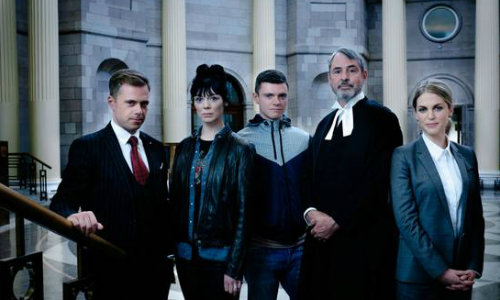 IFTN: Is there going to be a second series of ‘Striking Out’? IFTN: How do you find Drama in Ireland? Do you think we’ve come a long way in terms of the standard that we bring to the table? IFTN: Do you think we are punching above our weight in terms of the standards considering we wouldn’t have the same budgets as America for drama? IFTN: What do the IFTAs mean to you? IFTN: What are you wearing? Amy was nominated for Best Actress in a Lead Role in Drama in a very strong category of Irish talent which included, Caitriona Balfe (Outlander), Elaine Cassidy (No Offence), Ruth Negga (Preacher) and Anne-Marie Duff (Murder: The Lost Weekend). ‘Striking Out’ is produced for RTÉ by Katie Holly and Yvonne Donohoe of Blinder Films with international co-financing from DCD Rights and Acorn Media Enterprises. The series was created by James Phelan (‘Wrecking the Rising’), written by Rob Heyland (‘Between the Lines’,’Whistleblowers’), Mike O’Leary (‘Eipic’, ‘Misfits’) and James Phelan and directed by Lisa James Larsson. Full coverage of the 2017 IFTA’s will air on RTÉ One tonight Tuesday 11th April at 22:15.